American Fine Sinter has won a supplier award from the Toyota Company of North America for excellence in value analysis achievement. AFS is the second Tiffin automotive parts manufacturer recognized by Toyota, joining Taiho Corporation of America, which received a technology and development award. Tiffin is home to the North American headquarters of AFS, located in the Eagle Rock Business Park. The company, which manufactures parts for the automotive, railroad, industrial machinery, and hydraulics industries, has undergone several expansions in recent years to accommodate growing production. American Fine Sinter (AFS) was established in 2001 in Tiffin, Ohio and started production in 2003. Today, Fine Sinter Co. a joint venture between Tokyo Sintered Metals (TSM) and Japan Powder Metallurgy (JPM), the parent company of AFS, is a $350 million company with more than 1,000 employees worldwide. The company manufactures parts for the automotive, railroad, industrial machinery, and hydraulics industries, and American Fine Sinter most recently has focused on valve seats and variable cam units for the automotive industry. Accepting the award, Taiho president Nick Isogai and sales manager Ken Kamata. TIFFIN, OHIO (March 20, 2018) – Taiho Corporation of America, a supplier of engine bearings, bushings, shoe bearings and vacuum pumps, was recognized with an Excellent award from Toyota Motor North America, Inc. (TMNA) at its Annual Supplier Business Meeting (ABM) on March 20. Held at the MotorCity Casino Hotel in Detroit, ABM brings together approximately 850 supplier representatives from across North America. TIFFIN, OHIO – August 22, 2017 – American Fine Sinter (AFS) announced today that it will be moving forward with the addition of two production lines at its North American headquarters in Tiffin, Ohio, investing $20 million in equipment and creating 25 new jobs. Tennessee was also a possible site. This company’s last expansion was announced in 2014, when the company invested $25 million and committed to add 24 new jobs. Since then, they have added 106 jobs and now have 246 employees. This project will fill the remaining space in that expansion with equipment to produce mid and high torque carriers for the Toyota Highlander, RAV4, and Camry, using new technology developed by Toyota. The Tiffin plant is one of three worldwide to use the process. With the previous expansion, real property tax exemptions played a significant role due to the cost of building construction. With this expansion, workforce has been the focus, as the company continues to hire at a rapid rate. Initiatives like the Seneca County Workforce Development Strategic Plan, Manufacturing Showcase, and the Student Job Fair are important for long-term success and have helped make the company comfortable with growing here. 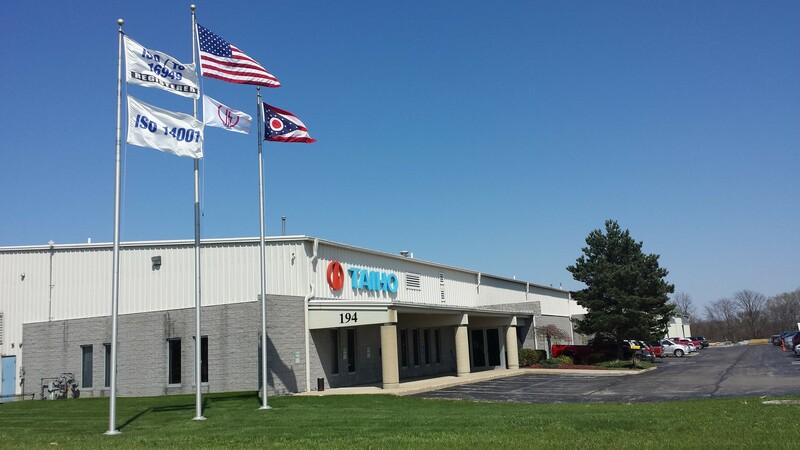 TIFFIN, OHIO – August 17, 2015 – Following approval of a local job creation tax credit by Tiffin City Council this evening, the Taiho Corporation of America is announcing its decision to move forward with an $8 million, 50-job expansion at its North American headquarters and manufacturing operation in Tiffin. The project is expected to be completed three years and brings the company’s total investment to more than $21 million since 2012. The Japanese automotive supplier currently employs 180 and manufactures more than 120 million parts a year at its Tiffin location, including engine bearings, bushings, and other specialty bearings – parts that go into such popular models as the Toyota Camry, Chevy Malibu, Cadillac CTS, and Honda Accord. The new project will allow Taiho to supply polymer-coated bearings and produce a completely new vacuum pump product line. “Any Taiho facility worldwide could have supported this expansion; we are very pleased that the Tiffin location was chosen for both projects,” Taiho President and COO Nick Isogai said. The Ohio location was competing with other Taiho locations in Japan, Thailand, and Tennessee for the project. The five-year, fifty percent municipal income tax credit — also known as the New Jobs Program — approved today is expected to be worth up to $37,000 over the term. In addition, the company’s existing Ohio Job Creation Tax Credit from its $13 million expansion in 2012 will capture the new activity and provide additional benefit to the company. Taiho is a global Japanese automotive supplier of bearings and bushings that has its headquarters in Toyota City, Aichi Prefecture, Japan. Founded in 1944, it currently has more than 1700 employees and over $1 billion in global sales is a $50M+ company in sales. It established its North American presence in 1980 and its first overseas manufacturing operations in Tiffin in 1996 as their first overseas base of operations. It currently employs 180 and operates out of a two facility complex in Tiffin’s Northstar Industrial Park with more than 180,000 square feet of space under roof. Learn more at http://www.taihousa.com. Based in Toledo, Ohio, the Regional Growth Partnership (RGP) is private, nonprofit corporation designed to drive job creation and new capital investment in northwest Ohio through business attraction, retention and expansion efforts. The RGP also serves as the JobsOhio Northwest network partner, serving as the JobsOhio point of contact and customer service for state incentives for a 17-county region. Learn more at www.rgp.org.